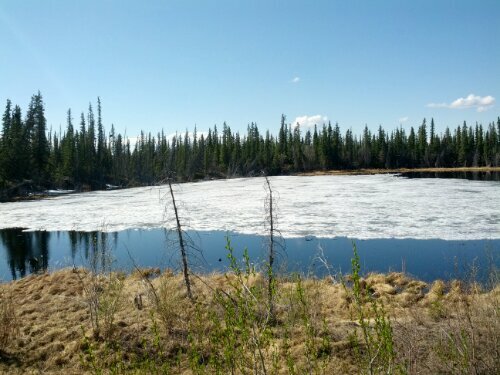 For hundreds of miles we have been warned by passing motorists of the twenty mile stretch of road between Beaver Creek and the Alaska border. It’s called “no man’s land” and apparently it has the worst road conditions on the Alaska Highway. Gravel, potholes, you name it. Well, these motorists apparently don’t drive on the shoulder because the road is about the same as we’re used to. We reach the end of no man’s land and cross the border into the US. The road quality immediately improves and we get through customs without hassle. A ladybug hitches a ride on my left leg for ten or twenty miles and we find an abandoned side road off which to camp for the night. Looking at the remaining mileage and number of days, we decide to take a rest day in the next town. 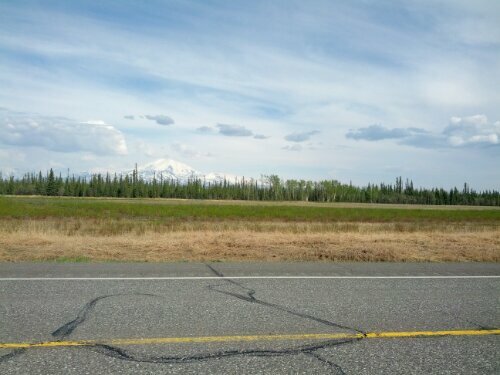 Tok, Alaska sits at the junction of highways 1 and 2, one of the few turns we have to take in two thousand miles. It only makes a fifty mile day but we have plenty of time at this point. Tok has what appears to be a dozen motels and one restaurant. Luckily there’s also a Thai food truck in town and so we are able to get some variety. The rest day is well worth it and we are lucky to have a roof over our heads as a heavy storm rolls by. While in the restaurant in town we meet the elusive touring couple from Seattle. Turns out they took the ferry to Haines and had been on the road for only a week. I am a little disappointed, was hoping we could swap stories about all the places we’ve biked through. On the road again we have a bike path for the first eight miles out of town before it ends abruptly. Winding between mountains, a heavy wind keeps us moving slowly. I attach my camera to the top of a small tree for a time-lapse over lunch only to watch the tree sway back and forth in the heavy wind. That footage probably won’t come out. 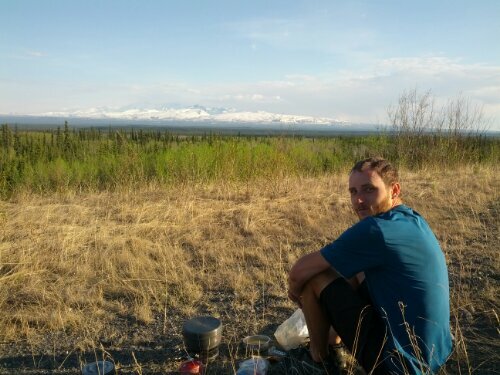 As the sun dips lower, we exit this mountain range and are greeted with an amazing view of huge mountains in the Wrangell-Elias range to the south. Donald spots a grizzly bear and it scampers away loudly into the woods. It’s harder to find a camp site here since much of the land adjacent to the road is privately owned and has no trespassing signs. Eventually a decent stretch free of signs appears and we push our bikes through a field of tall grass to make camp for the night. In the morning a caribou walks past our camp site obliviously as we begin to pack up. 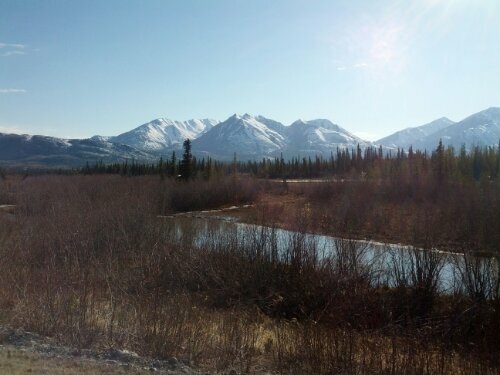 It’s another hot day – upper seventies – the news is calling this the great Alaskan heat wave. The road turns flat and there is severe flooding along parts of the road, probably due to increased snow melt from the heat. 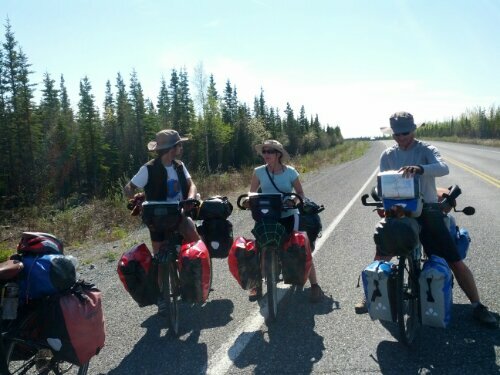 We come across a group of bicycle tourists headed east – two couples. They have just started from Anchorage and are headed south, potentially to Argentina. But first they’ll be stopping by in Seattle to give a talk about their previous tours. I hope I can meet up with them again there. Besides meeting other tourists, these past days have been the most uneventful in a while. Perhaps the tour has become routine, perhaps I’m simply ready for it to end, or perhaps they really were just boring. From here it’s a two day ride to Palmer, AK which is where my path diverges from Donald’s. There’s enough time for one more rest day and then I’ll make the eighty mile trip up to Talkeetna to start the next part of my trip. Wow, almost done (with the biking) already!